LEADERSHIP The office or position of a leader, the capacity to lead; the act of leading. CREATIVITY The conscious effort on the part of an individual or group to bring into being any circumstance, condition, object, relationship or activity. GENERSHIP The capacity to create with others; the community practice of creating. 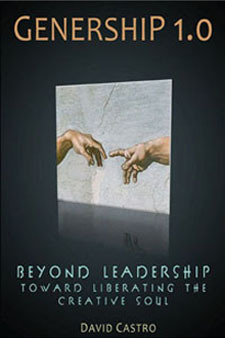 With over 20 years experience practicing, analyzing, and teaching effective leadership, David Castro observed its evolution and the need to do leadership differently, primarily recognizing the power of collaboration over dependence on a single leader. Genership releases this power to move our communities and organizations forward. Genership: Beyond Leadership Toward Liberating the Creative Soul redefines concepts of leadership, archetypes and modes of organization from a top down hierarchy to one based on interdependent systems. The concepts of co-thinking and co-creating underlie the practice of Genership.